This was a Golden Age, a time of high adventure, rich living, and hard dying...but nobody thought so. He was one hundred and seventy days dying and not yet dead. Then she settled down beside Joseph...alongside the world...prepared to await the awakening. The Stars My Destination has often been called one of science fiction's greatest works, sometimes the greatest. Yet, the first time I read it, I didn't get the fuss. The novel was supposed to feature an unforgettable character, the likes of which had never been seen in science fiction before. But Gully Foyle was a cartoon to me, an obsessed, brutal superhero/antihero force of nature, with hardly a nuance of human character at all. And within a short time, forgotten. Second reading, years later: Oh, yeah, now I remembered. And now I got the hyperkinetic plot better. But still—was Gully Foyle all that unique? Even for the 1950s? Now I was better read in science fiction and other violent, frenetic and driven characters of that time came to mind—in works by A.E. 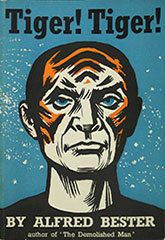 Van Vogt, Cordwainer Smith and others. And all that creative typography and swirls of graphics that were supposed to represent his psyche and his synesthesia (a confusion of the senses).... In the wake of 1960s psychedelia they just seemed primitive attempts at experimentation. And the ending in which the nearly all-powerful Foyle "jauntes" around the universe and ends up returning to an earlier innocent but wiser state—well, Arthur Clarke seems to have ripped off the idea for 2001: A Space Odyssey and others have sought similar personal apocalypses for their characters, so that it no longer seems novel. Ditto for the innovative science fiction elements that Bester introduces or popularizes in The Stars My Destination: teleportation (jaunting), psychic abilities (though actually better explored in his The Demolished Man), and cyborgs (technologically enhanced humans). They've become such standard elements in SF, especially in what became known decades later as the cyberpunk subgenre. Full marks for Bester's nearly unparalleled influence on the generations of scifi writers who followed him, but a big ho-hum for his work as read in the light of those later generations. Ah, now I really get it. The Stars My Destination (originally named Tiger! Tiger! after the first line of the William Blake poem and Gully Foyle's facial scars) is not supposed to be an ordinary novel of nuanced characterization and carefully paced plot. Rather think of it, with its hysterical personalities and outlandish gestures and bloody narrative, as opera. Bigger than life characters bellowing out their inner angst. Heightened theatre, using the speculative devices of science fiction to play out on the universe the revenge plot in which the highly wrought avenger is more profoundly affected than his targets. Space opera, if you will. But condensed. No pause for soul-baring arias or tender moments. We have to pick up our personal insights and relationships from the characters' non-stop actions. No musical interludes or washroom breaks. It's compulsive reading, the kind that when you don't quite understand what's going on you plough ahead nonetheless because there's something else you've got to know. And yet, I'm not sure that there really is anything to know at the end of the novel. Is it just the trip and not the destination—be it death or the stars—that matters? There are science fiction fans, highly knowledgeable and literate people, who read The Stars My Destination every few years and seem to benefit from it. I have to admit that, as explained, I've got into the novel more each time I've taken it on, which is usually a good sign of a book being a classic. All right, maybe one or two more tries a few years from now. Before I reach my own destination.